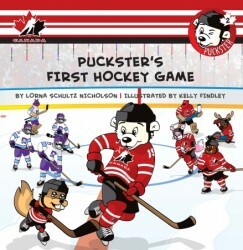 Puckster and his pals are excited to play in their first hockey game against the Racoons. The Racoons are known to be tough and mean. But Puckster and his pals step on the ice full of energy. When everyone scores a goal but Charlie, Puckster knows that teamwork is important and that every player is part of a team. Join Puckster and his pals to find out how the big game ends. This book has lots of good old hockey action.